Stone Mill One Sided Hanging Address Sign with Fleur de Lis- - personalized 12" x 16" slate plaque. Custom made for you. Bracket sold separately. Horizontal orientation with two lines of text, all-around border, and fleur de lis accents. Line 1 holds the address number; up to three 4" (approximately) characters. Line 2 holds the street name; up to fifteen 1.4" characters including spaces. 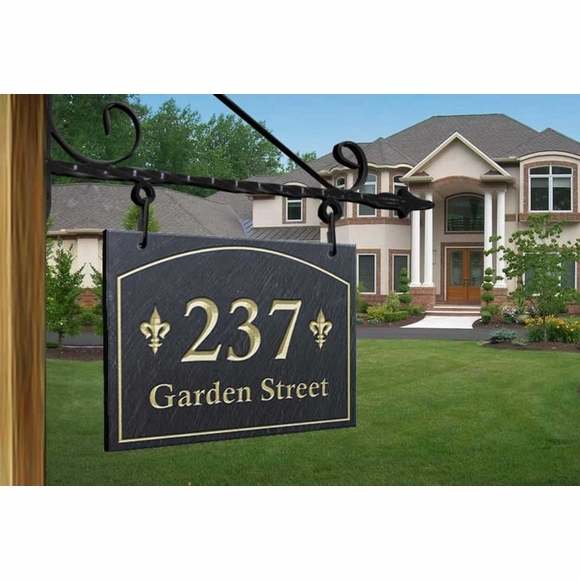 This hanging address sign also comes in a Vertical Orientation (see Related Products).